A History of North Lamar Blvd. Although North Lamar Boulevard in Austin is a humble and unassuming looking roadway, its history is quite colorful. This web page may be the first to attempt to cover the history of this unappreciated thoroughfare. This web page will cover North Lamar from Kramer Lane north to I35, a distance of just a few miles. North Lamar viewed from north of Braker looking to the north. April, 2001. Important Note: Unlike in most web pages, the text below is presented from the latest to the earliest. If you would like to tour North Lamar's history in chronological order, please scroll down to 1 and begin the historic tour. In the 1950s, the roadway known today as North Lamar was a very loud and colorful place, at least it was on weekends. At 11306 North Lamar, where CVS Drugs is today, stood the Skyline Club. The Skyline Club opened in 1948. It was a very large and well-known landmark with room for approximately 500 people. The Skyline Club was often a crowded place: on the Wednesday or Thursday "Nickel Beer Night" the cars visiting the Skyline Club would park not only near the Skyline Club, but also on the east side of the roadway where Albertson's grocery is today. "Sometimes you could hardly get through there because of the cars" said Clyde N., a North Lamar resident from 1948. 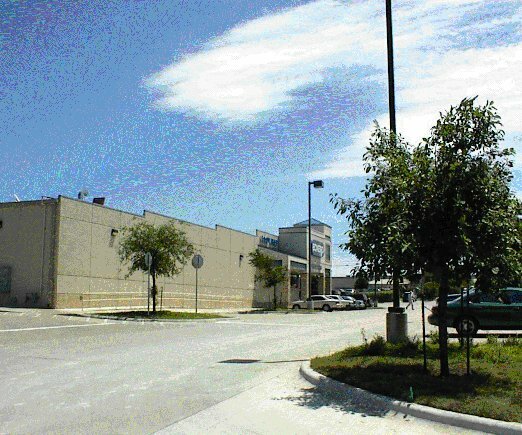 This is the Eckerd Drugs built at Braker and North Lamar in the late 1990s (photo taken 4/27/01). This is the previous location of the Skyline Club. This is a sketch of the Skyline Club. The Skyline Club was located where the Eckerd Drugs at Braker and North Lamar is located today. The Skyline Club was a well-known venue for country music and provided the setting for such noteables as Hank Williams, Elvis Presley, and Johnny Horton. One of the most interesting accounts of local events of the era involves the last public performance of Hank Williams in 1952 and of Johnny Horton in 1960. See Hank and Johnny. 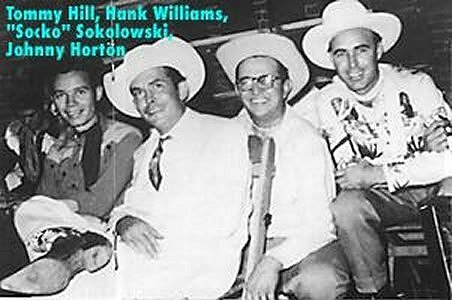 Hank Williams and Johnny Horton (second and fourth in this photo) played at the Skyline Club: Hank in 1952, Johnny in 1960. Elvis Presley (photo may have been taken at the Skyline Club in 1955). 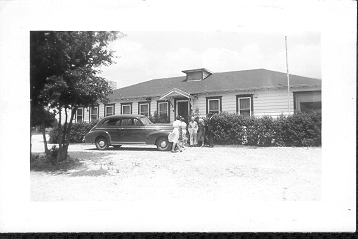 The motor court on North Lamar was built in the early 1950s by a family named Zimmer. The motor court is said to have been a "house of ill repute" at one time. 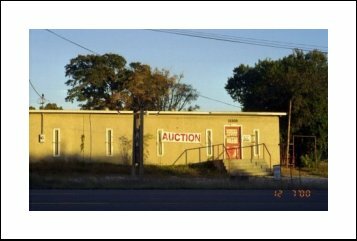 The Owl Club was a dance club built in approximately 1933, and located where the auction house on North Lamar is today. The Owl Club was built facing east--originally the roadway was on the east side of the building (see "Highway 81" below). After North Lamar was put in its current location (probably in the 1930s), the Owl Club did an about face and, ever since, the building has faced west. One night in approximately 1940 a Greyhound bus lost a wheel on Highway 81. The errant wheel crashed through the front door of the wooden strage building near the Owl Club and then out the back wall. Luckily, the regular occupant was not there at the time. (Gene Gault, personal communication, 2000). 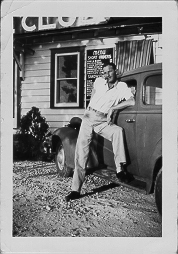 Edward Gault, owner of the Owl Club, circa 1940. The car is a 1934 Ford. In the 1940s and early 50s such greats as the Tommy Dorsey band visited the Owl Club. The Owl Club was owned by Ed Gault in the late 30's and 1940, then was owned by Gerald and Ruth Peoples, then by J. D. Talley. The Owl Club was closed in the 1950s. From 1958 to 1960 (approx.) the club was reopened by Leon Carter and was known as "The Spur" and was known for western music and Mexican music. In approximately 1980 the current building (picture above, on the right) was built on the frame of the Owl Club using some of the timber from the original Owl Club, and using two doors from the Skyline Club (see "Skyline Club" above). Behind the auction house a section of the original Owl club still remains. To see more photos of the Owl Club, go to Owl Club Pictures. This is a picture of Junior, a monkey that delighted many children at the Coxville Zoo in the 1940s. The Coxville Zoo was a privately owned and operated zoo located at what is today the intersection of North Lamar and Yager. For more information see the Coxville Zoo. The Bullhead Inn was an early area restaurant owned by a family named Bull. The Bullhead Inn was located on the old Highway 2 / 81 about a hundred or so feet south of where Yager Lane is today. Bonnie and Clyde are said to have visited the Bullhead Inn. For more information see the Bullhead Inn. 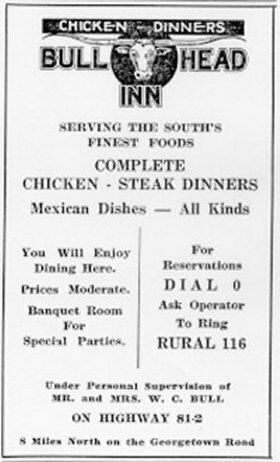 This 1933 advertisement for the Bullhead Inn mentions three of North Lamar's former names: "81", "2", and "Georgetown Road". 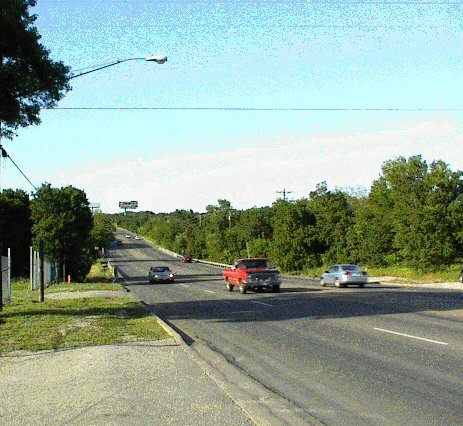 The roadway we now know as North Lamar was the major north-south route through Austin, Texas. The route has gone by many names and has been altered at certain points. 1900-1930 (approx) Highway 2 and Georgetown Highway. 1930 (approx) The roadway is altered to a slightly more western route. 1930-1970 (approx) Highway 81, Dallas Highway, and Georgetown Highway. Section of a 1928 Highway map displaying North Lamar as "Highway 2." A barely-discernible remnant of the original Highway 2 / 81 / Dallas Highway, where it diverges from today's North Lamar, may be seen today. An observer at the intersetion of North Lamar and Yager may look to the south southeast and see an old road that comes to the intersection. The old road is paved but has been somewhat encroached on by weeds and weathering. 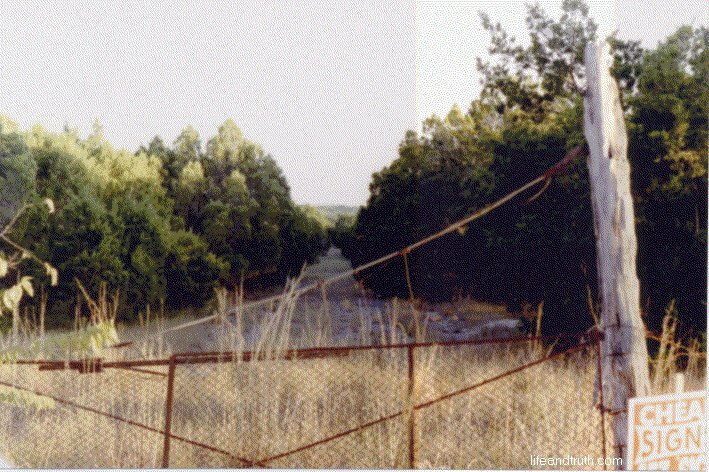 The road passes just behing the Auction house and old motor court, passes Walnut Creek east of North Lamar where the remains of a former bridge are still visible, and rejoins North Lamar south of Walnut Creek. The existence of this old road is now threatened: the property has recently been offered for lease. From the intersection of North Lamar and Yager a remnant of the original Highway 2 / 81 / Dallas Highway is still visible. This section was closed off in the 1940s. This is a view of Highway 81 where it crosses Walnut Creek today, a few hundred feet east of North Lamar. The bridge was removed in approximately 1940. The pavement and revetments are still in place, though overgrown with vines and weeds. Photo taken in April 27, 2001. The origin of the roadway now embodied as North Lamar is shrouded in mystery. There are some indications that a roadway approximating the current North Lamar goes all the way back to the Spanish era. In the 1920s a San Antonio native, William Longworth, apparently referred to the roadway as being on the "old Amrack Trail Runing [sic] from old Fort Montag De Bastin on Red River to Old Amrack Gulf Port." (Dobie Collection, Ransome Humanities Center, Univ. of Texas) Also, a 1981 report commisssioned by the city of Austin before developing Walnut Creek Park, Walnut Creek District Park: Archeological Testing, referred to a Spanish ox cart trail that passed through the property. Both of these references place this old roadway a little west of today's North Lamar. The location of Amrack is difficult to place. The old ox cart running through Walnut Creek Park may be completely covered over by this time. If any residents are interested in researching the origin of the roadway, there is plenty of legwork to be done.